Geishas compared with a Maiko/Geisha apprentice is less showy. A Geisha kimono is usually a strong base color with a simple design and subtle patterns based on scenes from nature or traditional Japanese themes, according to the seasons. Similarly, the Obi / cloth around his waist, as most tend to be brocade fabric of a single color, usually adorned with minimal Obi belts and brooches. 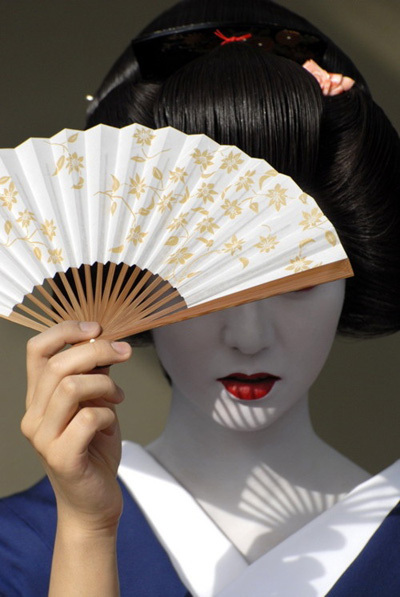 Everyday hairstyle of a Geisha is a relatively simple set of hair. Full-part wigs are worn for formal occasions and dance performances. At the more formal dress, she has a white makeup and wearing a black kimono with five symbols, two front and three at the back. A white-collar under the kimono is a sign of high status Geisha.